Your patio is like the icing on the cake—a perfect, enjoyable touch to your home. And while you may not think about types of patio doors, they are essential to the overall aesthetic of your patio area. For novice homeowners, patio doors seem straightforward, but in all reality, there’s much to consider with this vital part of the home. If you’re new to patio doors, you’re likely unaware of the many different styles that they are available in. Perhaps when you think about patio doors, you think of a sliding contraption, or doors that swing outward, reflective of a French style. There are popular styles of patio doors that are designed to fit with any home’s aesthetics; it’s just a matter of selecting the one that is the best fit for you. There’s nothing more elegant than French doors, and this style can immediately add class and décor to your patio. Let natural light pass through glass panels while you let this simple door style speak for itself. A classic look that allows the door to swing open on one side from the center hinge. You can select the right door or left door to swing open. These doors present a simple style with the pleasing look of symmetry. This is a common style for patio doors, making exit and entry towards the patio easier and more efficient. Sliding patio doors often have one glass panel, which is a perfect choice for those wanting an unobstructed view. There’s still more to know when it comes to patio doors, and door material is next on the list. Like door styles, there are many different materials your patio doors can be made out of. Most of the time, patio doors tend to match the other materials that the house is comprised of, like windows and siding. A popular choice of material for just about anything home related, and patio doors are no exception. Vinyl may be a cheaper cost but that doesn’t mean it falls short in terms of an investment. Vinyl has a long, energy efficient lifetime, meaning you’ll soon see a return of investment in both energy savings and the fact that you won’t be running to replace it for quite a long time down the road. Vinyl comes in plenty of colors and can even look like natural wood. You can’t go wrong with the classic look of wood. While you may find yourself having to upkeep your wood patio doors often, nothing beats the aesthetics of natural wood. Wood is a more expensive option for patio doors and will cost more in the future due to maintenance. Yes, aluminum is definitely a cheaper option for patio doors, but you’ll find yourself paying the price when energy efficiency is in question. Aluminum is not a material known for retaining heat or keeping in the cool. Additionally, aluminum is known to dent and scratch easier than other competing materials. A newly popular option for homebuilding materials, fiberglass is the top of the line, especially for French patio doors. Fiberglass lasts quite a long time and requires almost no maintenance. There are many different options of fiberglass available for customization. Patio doors should be selected wisely when it comes to energy efficiency. While you may not want to spend hundreds of dollars on door material, style of doors, and type of glass, do consider that if you go on the cheaper end of things, you could be paying the price when energy is concerned. Glass is a big component of a patio door, and cheaper glass could mean poor insulation. 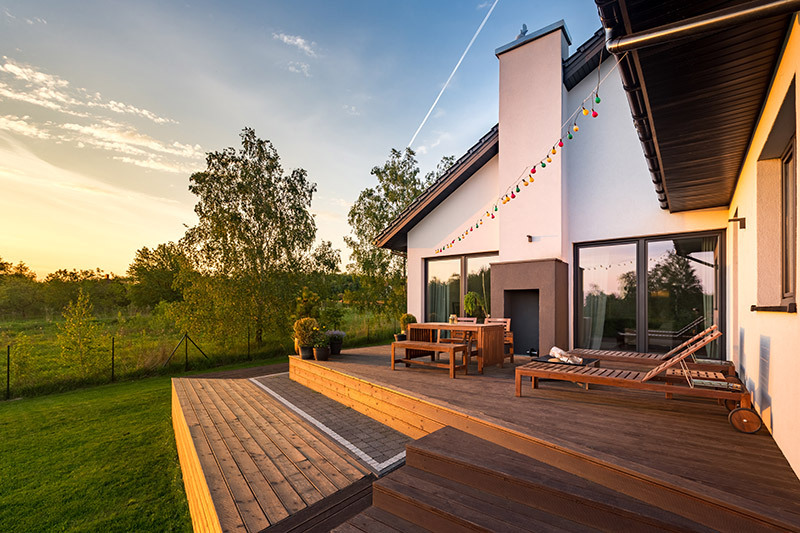 You could find yourself turning up heat in cold winters or cranking the air conditioning during hot summer months to compensate for the energy escaping from the patio doors’ glass panels. Instead, invest in Low-E glass because it will help lower energy bills throughout the year and protect your new doors against UV fading. Both doors and their glass panels should be considered in the overall purchase. As discussed before, some materials are better than others in the realm of energy efficiency. A patio door is an investment, just like any other house project. Ask yourself if you want to be spending the money upfront in a durable door or paying for it later in terms of energy bills? A simple or elegant style of patio door still requires some kind of privacy feature. Of course, this depends on the homeowner’s taste, but there are numerous options available for window treatments and fabric centered styles that can look trendy or classic, all while offering privacy. Homeowners can opt for bold patterns or easy neutrals depending on what they want to do with their patio door space. Curtains and other fabric-centered options are a classic route for patio doors. Deter onlookers and nosy neighbors with this timeless option and dually secure your home for this added stylistic privacy option. Or for those more into a minimalist style, there is the route of frosted glass (so long as you are investing in glass that is highly energy efficient). The crafty do-it-yourselfers can even utilize the frosted glass spray for a unique, customized effect. 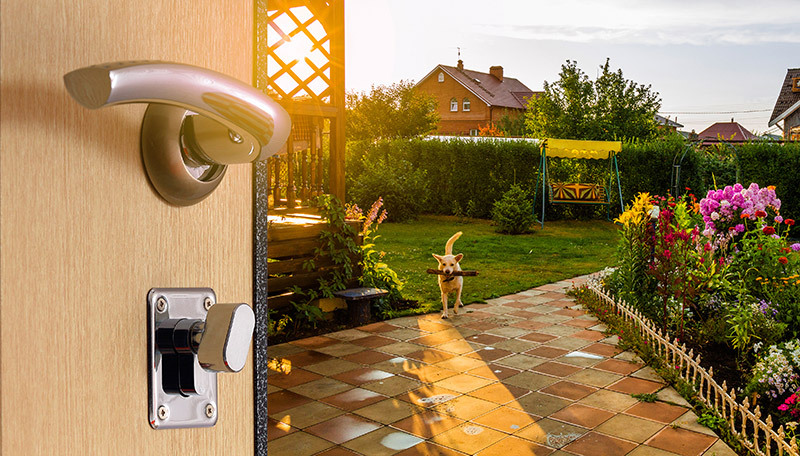 For your patio doors, do not overlook other accessories like doorknobs, screens, and decorative handles. Despite their size, these small accessories speak big volumes on the overall aesthetic of your patio doors. Little details and choice of material can compliment your new patio doors, taking them from simple to elegant in a matter of handles. While there are many different choices and types of patio doors to choose from, don’t be overwhelmed. Selecting your patio doors one category at a time is the easiest method, and allowing your budget to guide you, but not restrain you, can assist in making this decision. While you don’t want to spend money where it isn’t necessary, don’t limit yourself on the quality of doors you end up with, otherwise, you could be paying for them in repairs, energy bills, and upkeep. Now that you are an expert in all things patio doors, you should feel at ease in selecting which style, material, and decorative touches are right for you. Consider things like how much space you have to open your new patio doors (French style patio doors require room to open together), and if you will need a large opening onto your patio. By planning ahead, you are guaranteeing yourself years of satisfaction and enjoyment of your brand new patio doors. Now that you’re an expert on patio doors, Feldco can match you with the right patio door for your needs. Get a free quote today on patio doors.